After four three flavors of the HTC Hero, the Taiwanese mobile giant has finally brought back the chin with an additional lick of aluminum and a similarly quirky name -- the Legend. 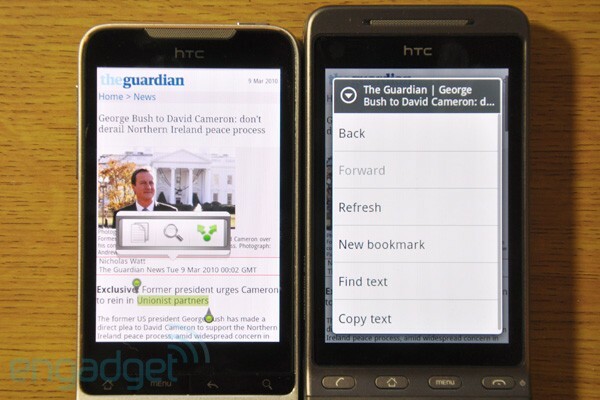 If this alone isn't of much interest to you yet, just bear in mind that this is HTC's first Android 2.1 device with Sense UI. It didn't take much for us to fall in love with this Android phone at MWC -- HTC convinced us of its unibody toughness by banging it against the wall, and needless to say, the vibrant AMOLED screen caught our eyes, too. However, there are still some questions to be answered before we can decide whether the Legend lives up to its name, especially on battery life, wireless reception, camera quality and software performance. Unless there have been major tweaks, we'll try not to bore you with features already seen on the Hero -- so please, won't you join us? How would you rate the Legend? Those who've used the Hero for some time will spot many similarities on the slimmer Legend. The phone's general anatomy on the front and sides remains unchanged, except for the keys below the screen -- the Search and Back buttons have pushed the entire row to the left, thus killing the pick-up-call key and flicking the power button to the top of the phone (near the 3.5mm headphone jack). Naturally, some may miss the ability to jump straight to the dialer, and the keys' occasional stickiness on our unit don't help, either, although this might be an isolated issue. The volume buttons -- now in the form of a thin silver bar that sticks out slightly -- have been moved up from the slope underneath to the straight side, making them more reachable and less prone to accidental presses. On the contrary, we found the new earpiece to be a tad higher than where we'd like it to be, so we often had to deliberately hold the phone lower on our ear to hear the call. The speaker on the back was amazingly loud, so good thing that we can quickly mute the ringer by placing the Legend face down (courtesy of the G-sensor, of course). Now, we can't speak on behalf of everyone here regarding the trackball being replaced by an optical trackpad -- in the long run, yes, the latter should in theory last much longer than the trackball, but there's no doubt that some prefer stroking the little ball to the trackpad that provides no tactile feedback. We lived happily with both, anyway, although the flat trackpad button was easier to push. 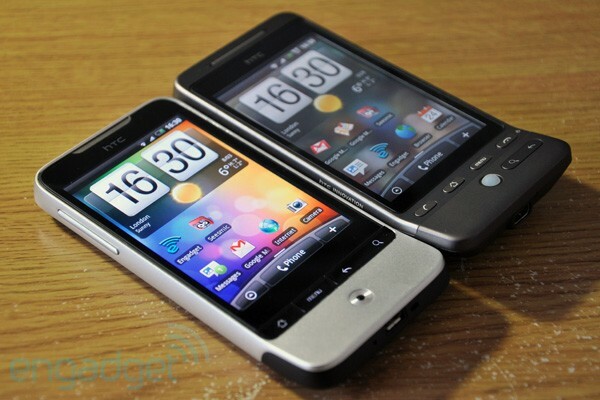 Like the Nexus One, the connector below is now a micro-USB port instead of ExtUSB as found on the Hero -- welcome to the party, HTC! Moving on to the backside: due to the aluminum unibody construction, we no longer have a big battery cover that required some skillful hands and long nails to pry open on the Hero; instead, we access the battery, SIM card and microSDHC card (spring-loaded slot) under a smaller rubber cover at bottom, while the camera, LED flash and speaker near the top are padded with some rubber. 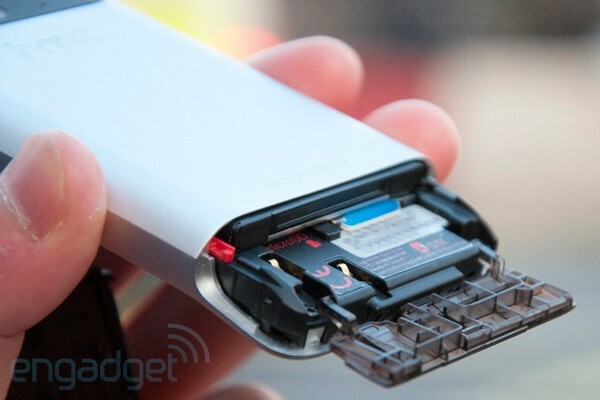 Here's an advanced warning, though: the battery cover is actually part of the cellular radio antenna, so removing it while your phone's still on means you'll be temporarily out of reach. Obviously, letting the kids or the dogs get near your rubber cover may render your Legend useless. Flipping open the inner cover underneath will also loosen the battery thus killing the power. Naturally, this slide-in design for the battery bay means third-party manufacturers will struggle to produce batteries of larger capacity. As for the general feel of the Legend's metallic body, it wasn't as slippery as we had initially expected, but understandably the Hero's back has better grip and provides a warmer touch. As we've seen at MWC, HTC's made some pretty neat changes to the Sense UI for Android 2.1, and we're not just talking about those fancy colors and icons. First is the handy Leap feature that lets you view all seven homescreens in one go (similar idea to the XPERIA X1's panel interface), and this can be triggered by pinch-zooming any of the homescreens or by pressing the Home button when you're on the main screen. Leap's been responding pretty well all this time with both input methods, but we've noticed that the panels are actually just stills of each homescreen as last viewed -- it would be nice if HTC can make them all live, or at least auto-update the panels every now and then. Next up is Friend Stream -- an aggregator app (with widget) essentially for stalking people by the means of Facebook statuses, Flickr and Twitter (which launches Peep when you click on a tweet). While this isn't exactly a breakthrough feature -- Motoblur already does this with its Happenings app -- it's no doubt a welcomed addition to HTC fans. A more useful update is the text highlighting tool -- on the Hero we've had to guess where we were highlighting due to the lack of a magnifying glass and start-end pointers, but thankfully HTC's figured that one out and stuck both features onto the Legend, and garnishing them with a small shortcut bar for copying, searching and sharing. On a similar subject, the keyboard is still as usable as the one found on the Hero -- we didn't notice any changes. Another tweak that deserves massive props is the menu for widgets and shortcuts, where you can now dive straight into the Program list instead of having to go into Shortcut first, and additionally, "HTC Widget" and "Android Widget" are now united under "Widget." Someone in HTC's office deserves a big hug and some chocolate for these fixes, but there are bonus candies if they can also fix Adobe Flash on the Legend -- the videos that we managed to play came out with pretty low frame rates (and needless to say games were not playable at all, if anyone cares), so we'll have to make do with YouTube and our own videos (3GP, 3G2, MP4 and WMV supported) for now. 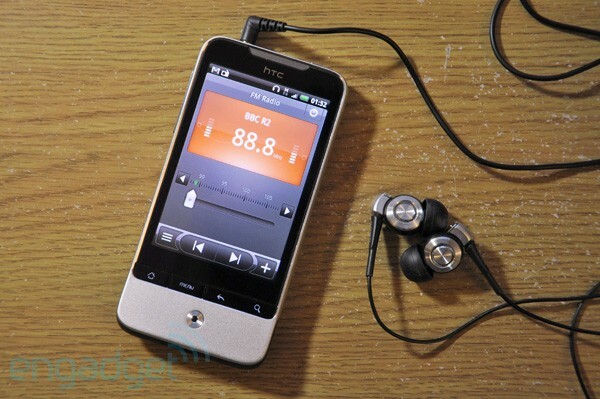 The Legend spoils us with way more choices than the Hero did when it comes to audio entertainment -- not only does it support a wider range of formats (AAC, AMR, OGG, M4A, MID, MP3, WAV and WMA), but HTC's also thrown in FM radio along with a nicely designed app that auto-scans for channels upon first boot. Like other phones, you'll need a wired pair of headphones for the FM reception, although HTC ran out of handsfree headsets so your guess is as good as ours regarding their headphones' audio quality (and yes, the pair pictured above are our own Sony earphones). We never got around to testing the stereo Bluetooth feature on the Legend, but we'd be surprised if it's buggy at this stage. Even though the Legend (Qualcomm MSM7227 at 600MHz) is clocked at just 72MHz more than the Hero (MSM7200A at 528MHz), we thought it'd be interesting to compare boot-up times, and behold: the Legend only needed about 20 seconds, whereas the Hero took almost twice as long. Nice work, Qualcomm! 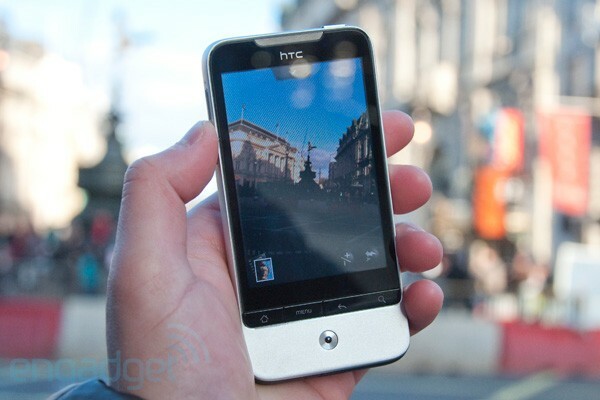 We then decided to test the Legend's battery and camera by treating it to a rare sunny trip around London. As fun as it sounds, the reflective nature of the AMOLED screen meant we had to keep web surfing to the minimal while out in the open -- perhaps some Super AMOLED could fix this. The Legend was our main phone throughout our five-day trial with it, and each day we listened to music pretty much non-stop (plus a bit of FM radio every so often), took the occasional photos and videos, and stayed connected to the web via 3G (with Google Mail notifications and a Twitter app's automatic update enabled). After all that extreme usage, the 1,300mAh battery lasted us for around eight to ten hours -- enough for those on a constant move or even the average gadget consumer these days. We were also pretty happy with how the Legend had managed to stay snappy most of the time, and more importantly, call quality was good on both ends even when used on the busy London roads. We've also spent a few nights with the Legend in bed. First thing we noticed was that with the brightness turned down to minimal level, the AMOLED screen was suddenly given a brown tint and some noise pixels. Again, this could be just the general disadvantage of AMOLED that could be fixed by coping with one or two brightness levels up. A more pressing matter that we discovered on the Legend was the weaker WiFi (802.11 b/g) reception compared to the Hero and many other phones -- in the same spot, the Hero managed two bars while the Legend struggled with one or none at all, which ruined our bedtime web surfing routine. That said, there's always the good old 3G if you're on an unlimited data plan. It isn't a nice thing to say, but we do have just a bit more hate than love for the Legend's camera. The 5 megapixel pictures taken during the day turned out pretty good, but night shots were hard to focus and some were terribly noisy -- it's what you get with small sensors anyway so we'll leave it there. However, the 640 x 480 videos were just choppy in general, and they became much worse when filmed in the dark. We've seen better filming performance on other smartphones so there's clearly some work to be done. To cheer things up a bit, the LED flash may be small but it did its job well with objects within two meters. You can see all the camera's good and bad below. It's safe to say that HTC's broken yet another mold with the Legend, stunning the world with both its hardware and software design. There's no question about the unibody's toughness, and many other features we've seen here are of significant improvements over the Hero, namely the AMOLED screen (in general), FM radio, optical trackpad (debatable), still camera and the new goodies plus performance boost in Sense UI. Sure, there are major flaws in the battery life and video recording performance, but there's a chance that these can be fixed via a software upgrade, if they weren't of hardware glitches. Some may have hoped for some 720p video capture capability, but hey, isn't that what the Desire's for? We hope so. Anyway, we'll know which one's of the best value when both phones are available in European shops.